We are SO excited to announce the canning of our Stonefly Session Ale, the Great American Beer Fest® Bronze Medal Winner in the Session Beer category! We are celebrating the release with what else but a classic fish fry! 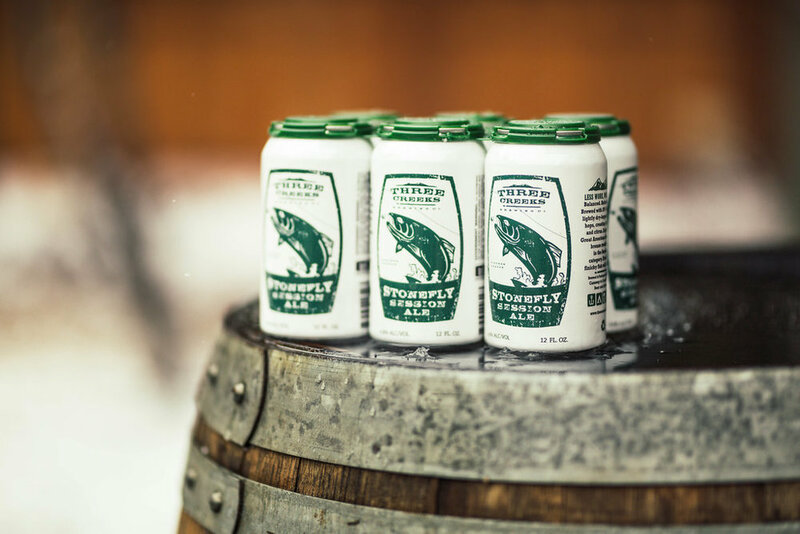 The Stonefly Session Ale is all about "Less Work, Mo' Fishin'!" So leave work early and head over to our brewing facility at 265 E. Barclay Dr. in Sisters for a Backyard BBQ. There will be music, giveaways, $2 cans, and, of course, fish fry! We will also have Warfighter Pale Ale on tap as well as our new Mexican Lager, Tres Arroyos! We are celebrating Spring with Great Beer and Great Food! 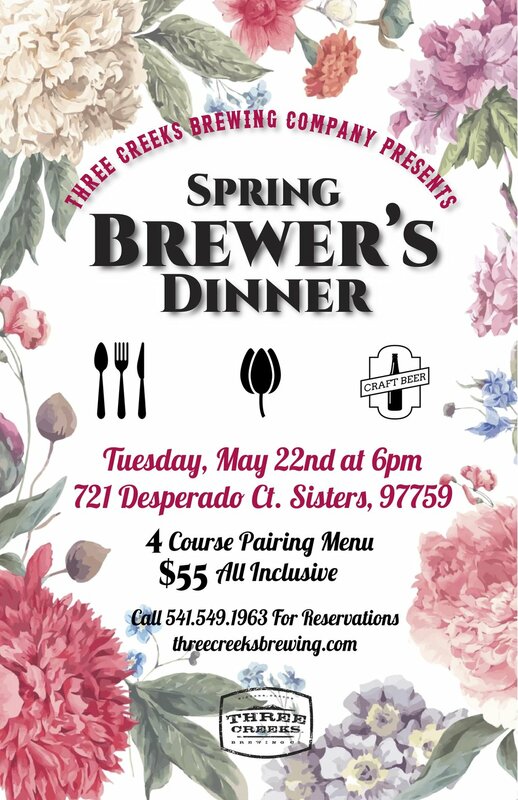 Join us, Tuesday, May 22nd, for our semi-annual 4 Course Brewer's Dinner. Cost is $55 per person and is all inclusive. Our Kitchen teams up with our Brew Squad to bring you sheer excellence! The menu will include everything from Chicken Mole with our Tres Arroyos Mexican Lager to Key Lime Shrimp with Stampede Strong Ale. Scroll down to view the selection. On Saturday, February 24th at 9am, join us at our brewing facility located at 265 E. Barclay Dr. in Sisters for our Annual Zwickelmania Breakfast! Stop by before your big, beer filled day in Bend to load up on breakfast beers, pastries and breakfast goodies from Angeline's, Sister's Coffee and more! Just around the corner from Valentine's Day, grab a date or a friend, or go stag and treat yourself! 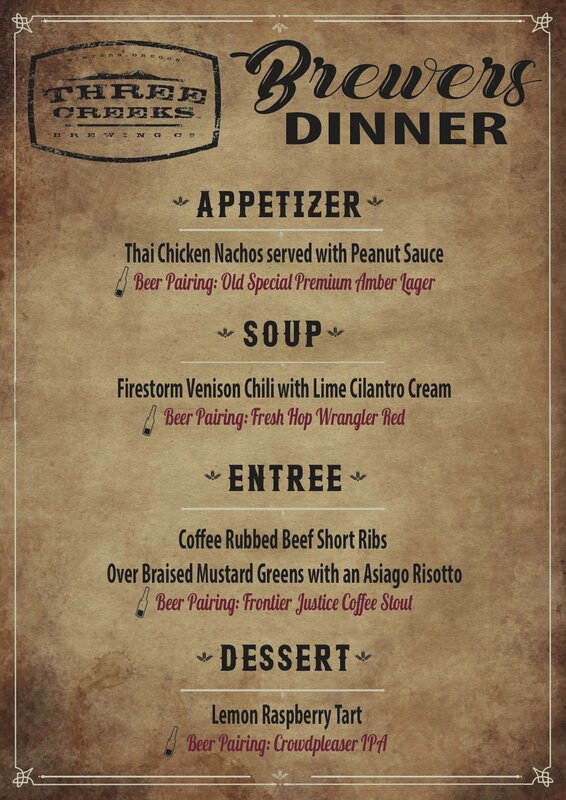 Join us, Saturday, February 10th at 3pm for the 6th Annual Beer & Dessert Pairing! We will be featuring some of our absolute favorite dessert beers, with delectable appetizers by head chef, Mark Perry. When Ross Robinson reached out to us to ask if he could hang out in our beer fridge for a couple of hours, we scratched our heads out of curiosity, but didn’t wait all but two seconds to shout out YES, without question. The 22 year old professional snowmobiler is participating in a Polaris fueled winter campaign called Waiting For Snow Syndrome. Ross is taking action sports by storm from a different angle: The Snowmobile. We had a chance to sit down with Ross and find out a little bit more about him and what he’s all about. Ross Robinson: Well I am born and raised in Sisters. My dad grew up snowmobiling. He got me into the sport at a young age. I have young memories on a snowmobile. I would sit on my dad’s lap. TCBC: Did you know from a young age that you loved the snowmobile? RR: It wasn’t necessarily that I loved it more than anything, it was just what I did and what was there. I love every aspect of it, though, from the progression, the pushing myself. I love the marketing and product testing and all of the other things that I get to do as well. TCBC: Do you do any other snow sports? RR: I was a competitive snowboarder from 10-13. Until 13, I wasn’t big enough to ride the snowmobile by myself. TCBC: What is it like to have a career as a snowmobiler? RR: Right after high school, I went to Colorado. For four seasons, I worked for a guiding company called Burandt’s Backcountry Adventure out there. They specialize in taking out advanced drivers and showing them what a snowmobile is capable of. It would be like going heli skiing. There, I built relationships with different companies and people. I was able to travel all over the world. I got to spend the last two summers in South America. TCBC: What was south America like? RR: It was the coolest place I’ve ever been. Especially growing up in a small town, everywhere we traveled growing up was relatively close. So to get on a plane and go halfway across the world was incredible. Riding in August. TCBC: Have you gotten to travel anywhere else? RR: Western US, Canada, and it’s looking like I’m going to Sweden in February. TCBC: Where do you see your career going? RR: I left my job in Colorado which started a big change with how everything will look because I saw so many people personally in Colorado, but now I have to generate an audience via social media, etc. The goal would be to figure out how to make a true living out of it, without guiding, which isn’t normally done. TCBC: What kind of beer do you like? RR: Since we are in the hub of it right now, I love all of the IPAs. It took me a while to warm up to them. Now when I’m traveling, I seek out craft beer. I always try to find a central Oregon beer, but if not, ill drink something local to where I am. TCBC: What’s your favorite TCBC beer? RR: Crowdpleaser, as of now.